We’ve been joyfully tinkering in our workshop these last few weeks. What’s our project? 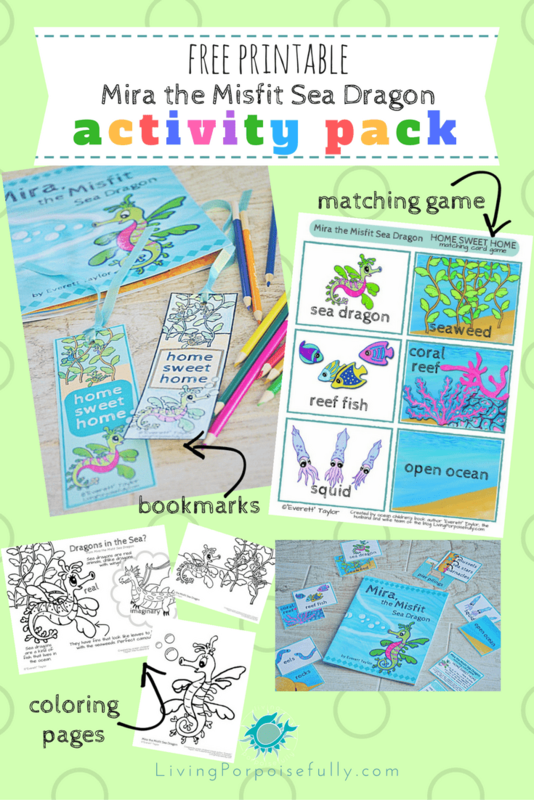 An activity pack that goes with our latest book, Mira, the Misfit Sea Dragon! Printable coloring pages, a bookmark (one to color in, one that’s full color), and even a matching game to learn ocean animals and their habitats! We think it’s a little bit of heaven for parents and teachers too…more engagement, more learning, more FUN is always welcome, right? If you’re giving the book as a gift (hint, hint), why not include the activity pack as a bonus! Print ’em, read the book together, and have fun. Choose between the full color version and black and white to color in with crayons or colored pencils. Punch a hole in the top, and tie a ribbon on top to finish it off! Featuring our star character, Mira, these printable coloring pages make for a coloring fiesta with a splash of learning. Imaginary dragons make an appearance to reinforce that sea dragons are real animals! The crème-de-la-crème. This printable card game gives kids a chance to apply what they learned in the book about ocean animals and where they can be found in the ocean. Squid, reef fish, eels, mussels, sea stars, barnacles, and sea dragons are all included. Print on cardstock, cut, laminate if you’d like, and then play!